Game of Thrones invites you to join a world where you can solve your problems with a sword and saddle. 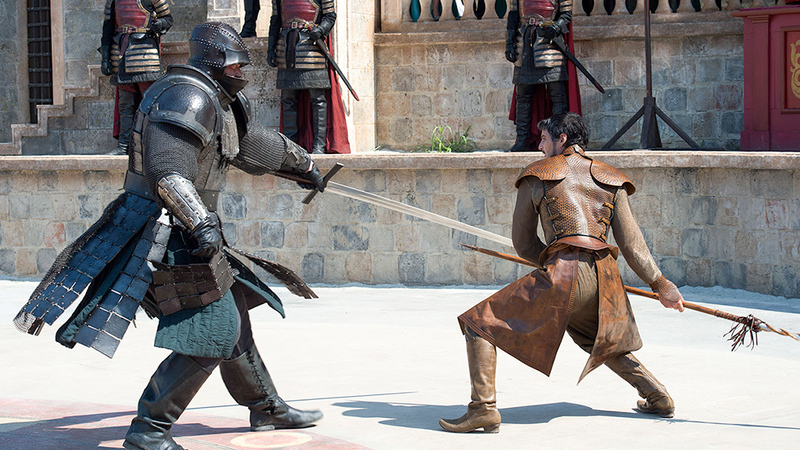 The television series is filled with gruesome fights , unexpected twists and cunning plots. 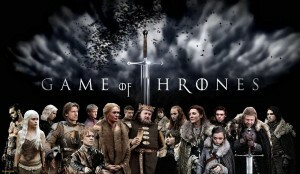 It has kept audiences hooked for five years now with its season 5 ending just last week. Here are some reasons why we can’t stop watching this series ….. If you really watch the show and have understood the plot then rest be assured you are definitely smart. The complexity of every character , the way the story line keeps changing and the numerous additions to the cast can make anyone go crazy. So smart is this show that in fact it can be hard to follow, but doing so is rewarding, since our brains crave the cerebral work the show has us do If you are still sane and following this show, trust me, you are smart. You really can’t decide a favourite character because the moment you start liking one he either gets killed or turns evil. The greatest example of this is Stannis Baratheon . A few weeks ago everyone was rooting for him to be the one true king. But after his sacrifice of Shireen to the Lord of Light there was a lot of changed opinions . This actually happens to every character.Hence deciding if a character is good or bad is pointless. you have to like for their faults as well. We become so emotionally invested in the characters in part because they’re more human and flawed, just like us. 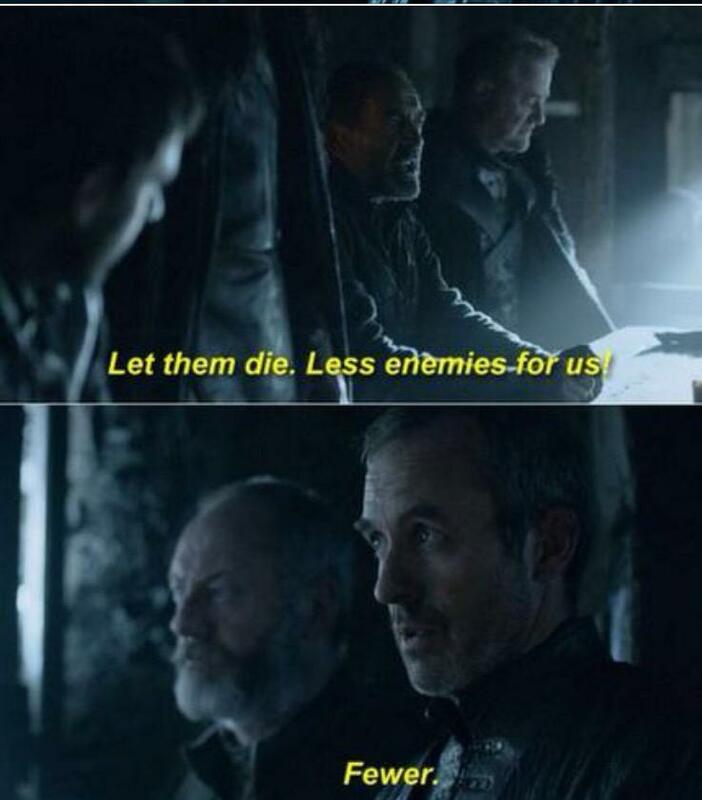 Well at least Stannis is still our King of Grammar. The steamy scenes , the unexpected fights , the gruesome deaths all add to intrigue surrounding this show. All with that all those moments when you nearly fall off your seat in excitement or horror. (More likely horror). Whether it’s the epic death of Ned Stark or the bloodshed seen in the Red Wedding or the horrifying death of Oberyn Martell Game of Thrones never fails to shock its audience. You really don’t know what to expect. It’s extremely frustrating at times but thats what it’s all about.Central characters are killed, psychopaths claim power, weddings becoming a bloodbath and bad guys develop consciences as time passes. But the high level of anticipation always takes you back. The heart-throb – Jon Snow , the ever favourite Tyrion and the mesmerizing Khaleesi add to the oomph factor to Game of Thrones. We also love the spunky Arya Stark struggling in Bravos and Sansa who’s far away from any kind of peace. We love the wicked ways Cersie’s mind works in and we just love Jamie for everything.Called ‘The Imp’ or ‘The Half Man’ Tyrion is also supremely intelligent and possessing of a quick, biting wit.But who can forget the Dragons.One of the main attractions to the show after the conniving queen, a ruthless king, a valiant knight, and ice zombies are the Dragons. 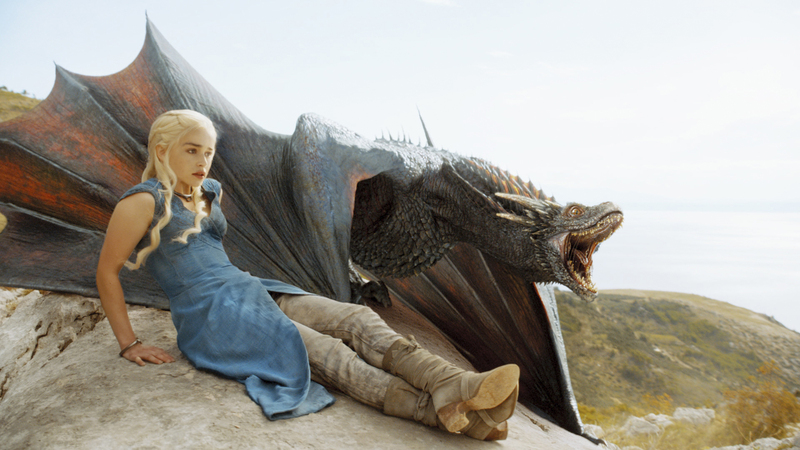 We are awaiting their flight to Westeros.